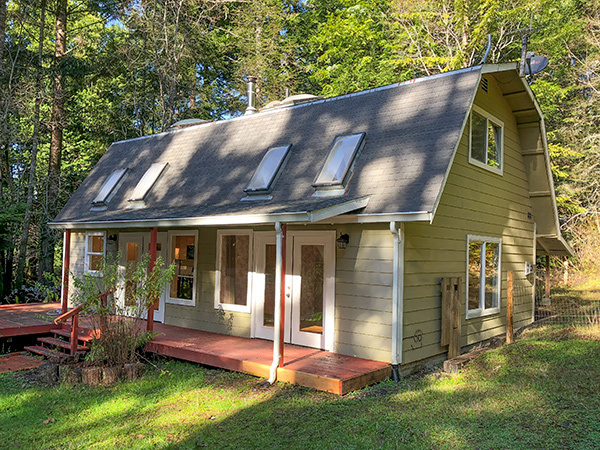 An ideal place for lovers of peace and nature: situated on Liscom Hill surrounded by fir and redwood trees, close to Blue Lake and minutes away from Arcata. This cozy and beautiful property is a perfect family or holiday home. The clean and tidy, two level home built in 1999 has 3 bedrooms, 2 baths, living room with gas fireplace, kitchen and dining with wood burning stove, lots of skylights, and a covered front porch for outdoor enjoyment. Built with wood or tile flooring, wood trim and details, this home fits nicely in its natural environment. Mature trees, with gorgeous outside chill-out areas the 1.45 acre property has a very relaxed atmosphere, guaranteeing maximum well-being in a very natural style. Enjoy the tranquility and solitude here.